“Captain” Kyle Williamson is the founder and executive producer of Fandom Spotlite, a news and entertainment outlet that covers conventions, fandom, cosplay and geek culture. He is the host of Cosplay Spotlite with Captain Kyle, a talk show highlighting cosplayers. Kyle also writes many articles, conducts interviews with various actors and pop culture influencers, and produces videos that provide commentary and reviews on selected movies, television shows, costumes, toys and props. He is an actor as well, having appeared in various independent and fan films, some of which he also wrote and/or produced. He is also a cosplayer, with over 30 different costumes, and is well known for his portrayal of The Walking Dead’s Governor, Doctor Who’s Jackson Lake, Star Trek’s Q and The Flash’s Jay Garrick. 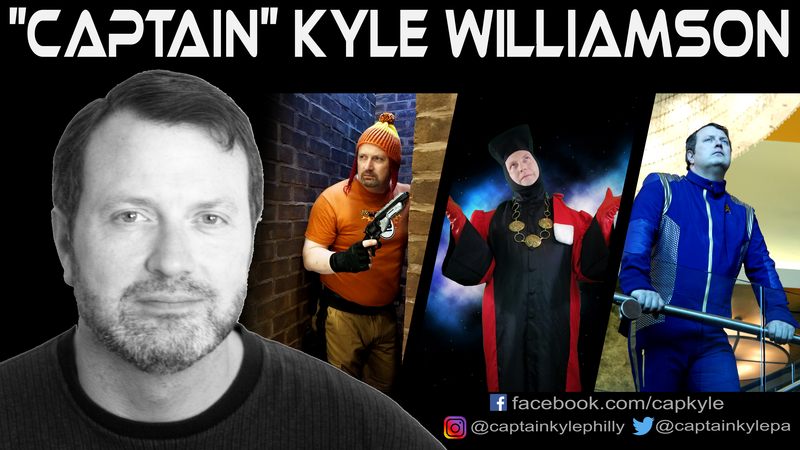 Captain Kyle is an advocate of positive fan experience and promotes cosplay as a means of individuals expressing their joy of their fandom without regard for gender, ethnicity, age or body type. His book, “Elements of Cosplay: The Costume and Beyond” is a guide to the world of cosplay and advises acceptance and inclusion in the cosplay and fandom communities. 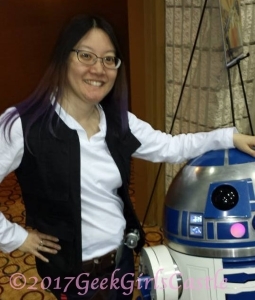 Jedi, actress, cosplayer, model, writer, artist, nerd and gamer only begin to describe her. Constance has mostly done theatre acting in the past, but has recently begun working on a film and television repertoire. She has done promotional modeling for events, and even has a TV aired commercial under her belt. Her Cosplays have included Juliet Starling of Lollipop Chainsaw, Claire Redfield of Resident Evil, Lara Croft of Tomb Raider, Scarlet Witch from The Avengers, Jadzia Dax from Star Trek, and more. When she isn’t acting, cosplaying, or modeling, she can usually be found with a controller in hand, on her desktop gaming, or writing Haiku. She is currently working at publishing her own collection of haiku, including illustrations. 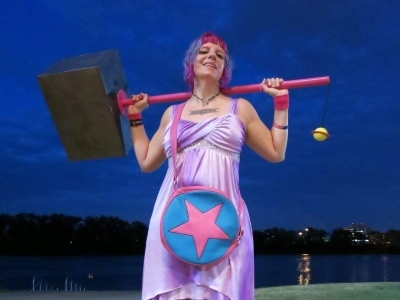 Tiki Twoflower is a lifelong leader, teacher, geek, and artist who has been crafting since before she can remember and making her own clothes and costumes since age 11. Her childhood dream was to become an actress, and now Tiki utilizes all of her skills as a cosplayer and fabricator, making her own costumes and offering commissions and sales on costume pieces and accessories. Tiki’s preferred mediums are clothing, fabric arts, hairstyling, and makeup. However, she also dabbles in props, accessories, and various other art forms. Her long list of cosplays includes Tiny Tina and TK Baha of Borderlands, Marceline the Vampire Queen of Adventure Time, Harry Dresden of the Dresden Files, and Amy Pond of Doctor Who. Along with character cosplays and comic conventions, Tiki enjoys steampunk, goth, and renaissance garb and faires, and she often works as a staff member for cons and faires alike. Missy says she’s just a chick who loves nerdy things ever since she was young. She has been a Star Wars fan since she was about six and saw Star Wars for the first time. Ever since then, she has loved sci-fi/fantasy genres, murder mystery genres, and most things geeky. Film and TV video production are a huge passion and hobby for her. She has been a producer, director, PA (production assistant), set decorator, sound designer, boom operator, and so much more on sets. Her IMDB page is http://www.imdb.com/name/nm6658602/. In her spare time, she loves traveling. Whenever there’s an opportunity to explore her world, she will. Disney is her favorite place on Earth. But she really wants to go to Japan and Hong Kong one day. She would love to go back to London and maybe take a side trip to Ireland and Scotland. Traveling gives her a better idea of others cultures and traditions that she can only read about from here.